Two containers are stacked on top of each other. The lower one serves as acontrol base with the power electronics. The upper container is to be seen as the battery. 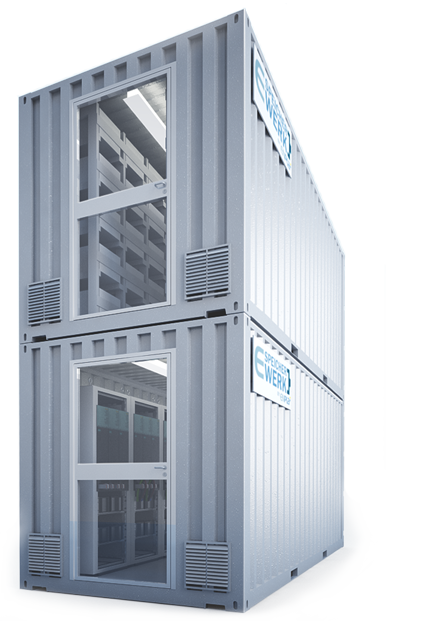 Our battery storage system is thus open to the technological advancement of cell technology in the future. Or you have other application requirements on-site? No matter what condition, additional cooling or heating is just as necessary as a customized medium voltage connection. Here you are well advised with electrical system engineering custom-made. State-of-the-art power electronics from SIEMENS in a solid, high-quality control cabinet. The lithium-ion cells as battery are not oxygen reactive and nonhazardous. The performance parameters for your company´s consumption and the company´s in-house consumers have optional power electronics with 250, 500, 1000 or 1700 kW. The storage capacity in kWh is scaled and configured to individual needs. Additional features are included and will be offered upon request. Also for large power storage systems should communities, municipalities and utilities check their existing possibilities for power storage subsidies.